At about seven o’clock in the morning of 17 June, the ground personnel of No. 73 Squadron embarked on a boat in Saint Nazaire harbour. The area was crowded with British troops – the remnants of the British Expeditionary Force in France. This force still counted tens of thousands of men, including the many support and logistical units of the BEF. This was to be the last chapter of Operation Ariel, the evacuation of around 200,000 British personnel remaining in France after Dunkirk. Leaving the quay with almost 200 people crowding on her deck, the boat made its way out to sea. The men were told that they would be transferred to a large troop ship which waited on anchor approximately three miles off the coast. The sea was calm, glistening in the bright morning sunshine as the flotilla of vessels – fishing boats, baliseure, trawlers, harbour tugs – moved away from the shore. The coastline almost disappeard in the haze before they could see their destination. RMS Lancastria, a pre-war Cunard liner, still in her black-and-white livery but now serving as a troop ship, presented an impressive sight. With seven passenger decks and 553 feet in length, she was the largest and most luxurious ship that most of the men had ever had the opportunity to see in close quarters. Onboard the Lancastria, urgent orders were received to take as many troops as possible, beyond her designated capacity of around 3,000. The German spearheads were reported only 25 miles away from Saint-Nazaire and any units left ashore were risking being captured by the enemy in a metter of hours. The personnel of No. 73 were one of the first to reach the ship. Upon arrival, they were shown to Number 2 hold. The No. 1 and 2 holds were essentially large enclosed warehouses in the bowel of the ship. Until the afternoon, that space filled with about 800 RAF service personnel. By then it was way too crowded for comfort and some of the men sought their way up to the open deck. While the ship continued to receive ever-more troops shuttled from the shore, some of the officers and men onboard enjoyed a well needed breather. Breakfast was being served in the dining saloon, with freshly baked bread, eggs, bacon, marmalade and coffee. The barber shop was serving as many bearded men as they could cope with. RAF Hurricanes, presumably of No. 73 Squadron, were seen patrolling overhead. Just before 2pm, alarm bells rung for an impending air raid. A formation of German bombers appeared, fortunately concentrating their attack on another ship, Oronsay, which laid on anchor within the sight of Lancastria. 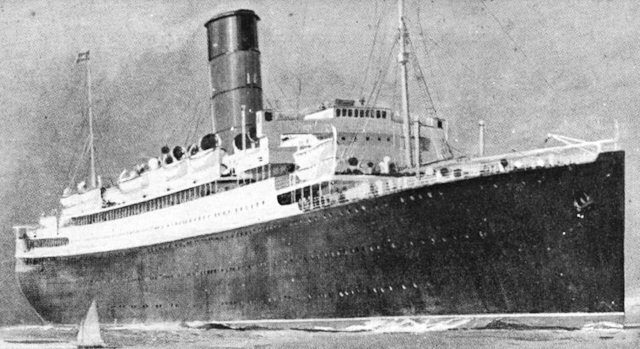 Immediately after the attack and with her decks and cabins heaving with soldiers, Lancastria set sail. It is impossible to say with certainity how many men were onboard; initial estimates put the figure at almost 9,000 embarked; a general assessment accepted today is between 4,000 and 9,000 people. A bare 9 miles off Saint Nazaire, enemy aircraft appeared again. This time there was no doubt that Lancastria would be the target. One Ju 88 made its bombing run in a shallow dive, dropping four bombs. Three of them hit. The first bomb penetrated to No. 2 hold, exploding and instantly killing everyone inside. Another bomb went down the funnel and went off in the engine room, immobilizing the ship. The third exploded in number 3 hold, rupturing the fuel tanks holding 1400 tons of oil. Lancastria was doomed. In 20 minutes, she turned over and disappeared under the surface, dragging with her thousands of unfortunate souls trapped inside her hull and leaving about as many struggling for survival on the surface. Those in the water were being choked and poisoned by her fuel which was spreading like a thick carpet over the water. Oil was everywhere, stucking to clothes, hair, clogging the eyes and getting into lungs. 2,477 survivors were rescued. Of No. 73 Squadron personnel, 6 were reported killed and 31 missing, most of them probably perished in the hell of No. 2 hold. 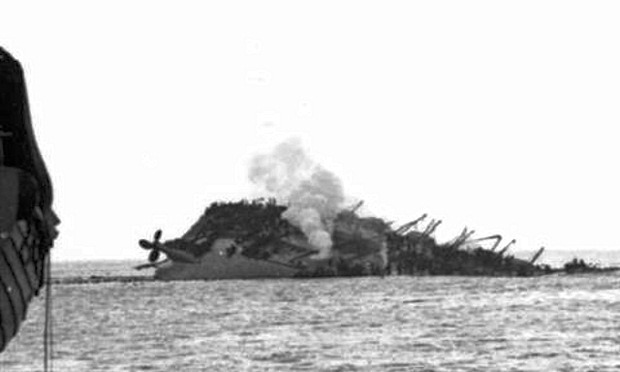 The sinking of Lancastria was the worst tragedy in British maritime history, greater than the Titanic and Lusitania disasters – combined. The exact death toll is not fully known. Estimates range from 2,500 to over 6,000 lives lost. The tragedy of Lancastria would remain unknown to the public throughout the war. Even today, her story remains an obscure episode of the French capaign, all but forgotten in the shadow of the “Miracle of Dunkirk“. The site of her sinking is still not oficially recognized as a British war grave. Another gap in my knowledge of the 2nd World War filled. I had never knew read about this harrowing episode which – although there were soldiers aboard – easily compares to the sinking of the Wilhelm Gustloff. Thanks again! I came here because I adore the beauty of the Spitfire and its ingenious engineering, but this is of equal value to me.